Never a dull moment’ is not just a cliché in the context of Pakistani politics; it’s a living reality which was seen in all of its mind-boggling dimensions in the Senate elections March 12. The Senate is the upper house of Pakistan’s bicameral legislative setup whose membership is distributed equally among all four federating units of Pakistan, plus the federal capital Islamabad. Because of parity among all four Pakistani provinces, Balochistan, the least populated, stands at par with Punjab, which has more than 60 per cent of the nation’s population. The spirit of parity theoretically confers equality of status to big and small alike. One-third of senators retire every two years because of the total six-year life-span of a senator. Senators are elected indirectly by each provincial assembly of Pakistan. One-third of the Senate was due for fresh elections earlier in March. That’s when the political circus kicked in with gale force. The ousted and disgraced Ex-PM Nawaz Sharif had a lot of hope riding on the juggernaut of these Senate elections as far as his dream of relaunching himself at the centre of Pakistani politics was concerned. Nawaz’s party has a clear majority in the National Assembly, the lower house of Parliament. However, it didn’t have enough strength in the Senate to give it absolute control of Parliament. But it hoped to overcome the deficit in the March elections of the Senate. 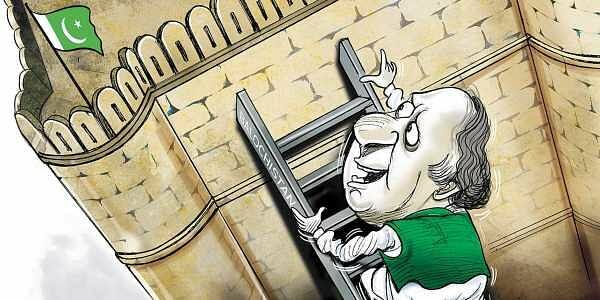 An absolute control of Parliament was deemed a sine qua non in Nawaz’s quest to reinvent himself by amending the Constitution, which in its present form debars him from leadership because he’s a corruption- tainted leader. He hoped that the Balochistan Assembly, where his party was in a coalition with minor factions and ruled the roost, would help fill the gap in the Senate in the March elections. But Nawaz obviously either overvalued his ‘popularity’ or underestimated the long reach of the ‘establishment’ arrayed against him. In his blinkered infatuation with his so-called charisma and mass appeal, he lost sight of the ‘deep state’ of Pakistani political culture, which has long been adept at the ‘game of thrones’, and over the years, has mastered the art of pulling the rug from under the feet of many a pretender to absolute power. Its list of victims includes Nawaz too. The drama to cut Nawaz to size and forestall his tactics to use Balochistan as the ladder to catapult him back to the helm of Pakistan began in early February. It was then that an inhouse ‘revolt’ was masterly crafted in the Balochistan coalition government which, until then, had no challenge from any quarter and was known to enjoy Nawaz’s blessings in spades. Nawaz and his cronies, who have been waging a crusade to defame the Supreme Court of Pakistan since his unseating and disqualification by the apex court, cried foul at the turning of tables in Balochistan. But the die had been cast and the dice loaded against him. The rebellious Balochistan Assembly didn’t give Nawaz’s party as many new senators as it had hoped. But Nawaz thought he could still load the dice in his favour by capturing the coveted post of Chairman of Senate, which could still help realise his dream of rewriting the Constitution to rehabilitate him. Nawaz was upbeat because his party had garnered the highest number of seats in the new Senate, and with the help of smaller parties, could chalk up a majority in the house to put his own man, a crony of choice, at the head of the Senate. But Nawaz, sadly to him, again underestimated the ‘deep state’s’ dexterity to pull a rabbit out of its hat whenever it so desired. The shadow masters of the ‘deep state’ struck at the crucial time just a day before March 12 when the Senate was slated to elect its chairman and deputy chairman. Nawaz and his cohorts were dumbstruck when at that critical juncture when his fate hung in the balance, his two principal rivals, former President and leader of Pakistan People’s Party, Asif Zardari, and Imran Khan, the charismatic leader of Pakistan Tehreek-e-Insaf, struck a deal to jointly field their own slate of candidates to challenge Nawaz. Bringing Zardari and Imran on the same platform, and under one flag, was incredibly innovative. It was truly a masterpiece of political engineering to coalesce two outspoken critics of each other. Zardari had no love lost for Imran who, on his part, never shied away from lambasting and ridiculing Zardari, from every available pulpit, as the epitome of corruption in Pakistani politics. But these two sworn enemies agreed, nevertheless, to sink their differences, even though temporarily, for the common cause of stopping Nawaz’s train in its tracks. The manoeuvring paid off when Nawaz’s nominees for chairman and deputy chairman of the Senate were soundly trounced by the slate backed by Zardari and Imran. The shadow masters of the deep state smirked with contentment in their corners while Nawaz and his cronies were left to lick their wounds. The Zardari-Imran marriage of convenience lost no time to unravel. The two stalwarts of the Pakistani political landscape are at loggerheads with each other again now, as they were before. As these lines are being written they are busy at their old game of slogging insults at each other as they vie to have their own candidate elected as the leader of opposition in the Senate. The bottom line of the episode, distasteful and sordid to most pundits, couldn’t be much different than what many an observer agree upon: Pakistan’s democracy is still beleaguered and hamstrung because of the mill around its neck, put there by the deep state. Few would disagree.